I was lucky enough to cross paths with a handful of travel bloggers during my trip around the world, and it was a lot of fun to meet the people behind the travel blogs I'd been reading. I find it at once amazing, and strange, that you can get to know a person through their writing. Last week, I had the opportunity to attend two happy hours and meet a lot of new and interesting people in the Washington, DC area. The first happy hour took place in The Saloon on U Street, and was a get together of World Hum contributors, travel writers, and their friends. I arrived at about 6:30 pm, as suggested by Michael Yessis, a co-founder of World Hum who lives in the area. While sitting at the bar, I realized that aside from a photo or two from Twitter and his blog, I had no clue how to identify Michael from the other patrons. At least the bar was small, because it made approaching random strangers and asking them if they were travel writers a palatable task. Five approaches and a few awkward laughs later, I met Michael, Julie Ross, and Andrew Evans. Over the course of the evening, we were joined by Adam Karlin, a writer for Lonely Planet, Chris Gray, Travel Editor for USA Today, Chris' husband, and Joanna Kakissis who had just returned from a trip to Bangladesh. Plus, there was Benjamin Spatz, who after returning to the States after a few years in Liberia, was as confounded by his new Blackberry as I was when I got mine. The conversations were great, as you might expect from such a well-traveled group, and also touched on the changing face of travel writing and media. 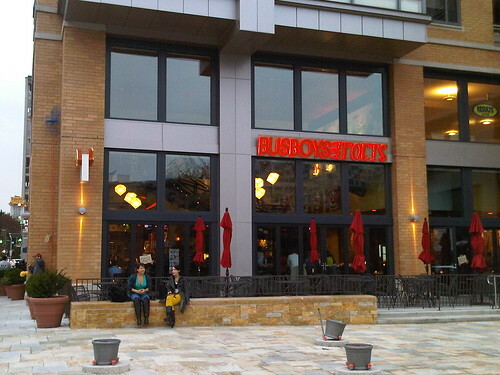 A few days later, I had the pleasure of attending the Art of Non-Conformity gathering at Busboys and Poets on 5th and K Street. As a reader of Chris Guillebeau's blog by the same name, I'd seen photos of past meet-ups and knew there could be a big turnout. I went early, arriving at about 6 pm on the dot, and the first reserved table on the second floor was already full. A kind soul vacated his/her seat so I could join the group, which also gave me the chance to talk a little with Chris before he'd have to start mingling with the new arrivals. In his invitation, Chris mentioned “The best thing about AONC meetups has absolutely nothing to do with me — it's about everyone else who shows up.” I didn't believe it until I actually begin to meet other attendees! I got to know the lovely Jen Lemen of Mondo Beyondo, and the friendly Justin Premick of AWeber (an email service I use for GoBackpacking's weekly newsletters). I met many others as well, including Nicholas Kralev who writes for the Washington Times, and Thursday Bram. I couldn't bring myself to mingle fast enough to meet even half the people who showed up over the three hour event. At some point during the night, perhaps at the end as the tab was being closed out, I remember telling Chris about going to Gary Vaynerchuk's recent booking signing for “Crush It!” and feeling really inspired by the guy. If Chris could garner that kind of response from the people who come out to meet him, including next year when his first book launches, he'd be in great shape. It wasn't until I reflected on the evening later that night, that I realized, he had done just that with as many people as possible, and without knowing it at the time, with me as well. It was great to meet you! I look forward to seeing you around DC. I'll be headed out and back into town in time for the Tweetup. Will try my best to make it! Great Anil – hope to see you there, looks like we could have a great group of people come out.